Tempco is your ISO 9001:2015 Certified custom manufacturer of electric heating elements, temperature sensors, temperature controllers & process heating systems. You can browse the categories below or Contact Us directly to find the product(s) that best fit your application. Custom manufactured electric heaters and elements for conduction, convection or radiant heating applications in industrial processes, preconfigured or designed to customer specifications. Standard & built-to-order products: Controllers, SCR Power Controllers, Thermostats & Relays. Power & Temperature Control Panels are built in our UL508A, UL698A & UL1203 cULus Certified Panel Shop. A variety of Thermocouple types including mineral insulated, multipoint, base and nobel metals; a variety of RTD types including accu-ohm, sanitary and melt bolt; General Purpose Thermistors and Sensor Accessories. 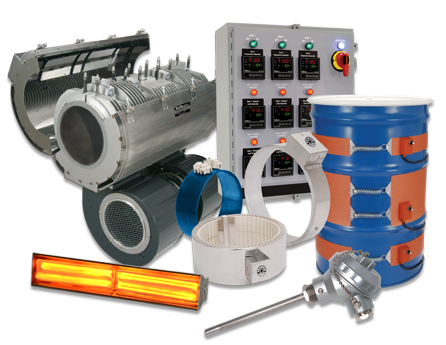 Complete Thermal Loop Systems consisting of electric heating element, temperature sensor and power and temperature control product custom designed to fit your industrial process. A variety of heater accessories from ceramic terminal blocks to spooled wire to termination housings to insulation blankets. Tempco thermal components are designed and built with you in mind. Tempco serves many industries. Find out more about how we can help yours! With 45 years of experience, we have established many processes that allow us to manufacture superior products that our customers expect.